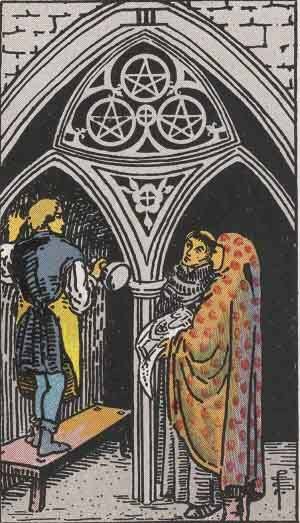 The Three of Pentacles is the third card in the suit of Pentacles. A largely positive card, you should expect good things to happen when you see it, especially when relating to work and career. The Three of Pentacles represents recognition (especially in career), certainty and clear goals. Past – The Three of Pentacles in the Past position can represent an intense period of study that is going to pay off. It can also mean that you’ve worked hard to get where you are now. If you keep going as you have kept going, you will master the subject you are studying. In the past you may have been a bit of a mentor, and that may or may not be the case now. It was a good time to look back on, but remember that he path forwards isn’t always an easy climb. We jump over obstacles and sometimes fall, so if the past looks brighter than the present, remember that despite the differences, you have grown as a person and are all the better for it. Present – The Three of Pentacles in the present position means that you have to spend some time to know more and more about your chosen subject. This could mean sending a bit more time mastering something at work to get ahead, or understanding a concept or possibly even starting a hobby you’ve previously pushed away. Now is the time! Generally in life, you seem to be on the right track, or at least improving. Try to act as a role model for other people. If you have qualities you’d like to see in others, display them in yourself first. This can be as simple as smiling and greeting more people than you usually do. Reaching out to others in any way often has a positive effect on the world, and your own life. Future – The Three of Pentacles in the future position can have a few meanings. You might create a good piece of work that will be much use to others and used as an example in your field. For example you may be studying. Your current piece of work will be used as a good example. If you’re at work, you might redefine how things happen and come up with a more efficient way of doing things. Others will applaud you for this. In a professional sense, this is good new,s but also look to improve yourself personally. How can you become a better person? How can you become a person that people want to be? these are the sorts of qualities you should be aiming for, there is no reason to settle for anything less. Work / Education – The Three of Pentacles in regards to work or education is a good sign. Your work is being appreciated and you may get put into a higher position in the work hierarchy. Keep working how you’re working now and you’ll set an example to others. Romance – The Three of Pentacles in romance is a mixed sign in romance It may mean that you’re going to have to look to past relationships to work out issues with your current one. If you’re looking to meet someone, it’s good to just keep doing what you’re doing now, even if that means doing nothing! Friends – The Three of Pentacles in regards to friendship means if there are problems, you’ll need to think cleverly about why they’re happening. It might be that you’re just not suited. Now, however, is a good time to work with your friends towards a common goal, be it a personal project, a holiday, a new hobby. Money – The Three of Pentacles in regards to finances means that you’ve been working hard and the financial reward is coming back to you. Pentacles are heavily linked to money and finances so expect a reward. Don’t worry about your finances if you’re going into the red, it’s going to be a life lesson for you. Health – The Three of Pentacles is more of a pat on the back for the good work you’ve put in to maintain your health, either through regular exercise or a diet. If you feel like you’re on the right track, continue. If you don’t put any effort into maintaining your body, you might just be worrying too much. Spirituality and Mentality – The Three of Pentacles in spirituality may mean that you can look to old stories, legends, myths, religions for inspiration for personal growth. Have an open mind and take in as much as you can. If you find something that challenges your current mindset, then you need to grow and adapt. Continue working as hard as you can, and try to bond with others. The reversed Three of Pentacles can suggest a lack of cooperation in your endeavours. Perhaps those involved have a different viewpoint. This can apply to a number of aspects of your life; work, school, romance. Make sure you are clear about how you feel with all involved, especially if this relates to a romantic question; your partner may have very different views on how you should both spend your time, effort and money. Three is a powerful number in numerology, and grounded in the material world (three dimensions). Creative, and stable, three can represent our life as birth, living, and death. The Three of Pentacles in a numerological sense reminds you that you’re influencing others in a good way. People may be looking up to you as a pinnacle, to set an example, and you’d do right to set it well. You may be working towards something at the moment. Don’t purely focus on it, remember that surrounding tasks still need to be completed. Take a wide lens view. We’ve selected live tarot readers to give you a FREE 3 Minute interpretation of The Three of Pentacles! Scroll through them below and pick your favorite one.